Show your pride and support in style with these two Mike Kelly's Cruise News T-Shirt designs. Both feature the original artwork of Adam Icenogle, with extremely vibrant multicolored silk screend prints by Daytona Trophy (known for their high quality work...such as the Turkey Run T-Shirts they produce completely in-house). They feature the Cruise News logo on the front breast area, with the main design on the back. The two styles currently available are the flamed 1941 Willys in Gasoline Alley, and the Turquoise 1933 Ford Woody Wagon being follwed into Old Town by a Camaro. Both designs are available in adult M, L, XL and XXL. The cost is $13.00 each, plus $3.00 shipping & handling. 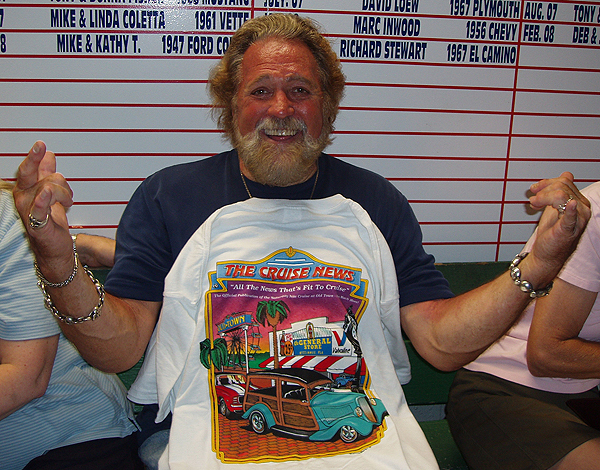 Dan Haggerty, who played Grizzly Adams on TV, with one of our magazine's T-Shirts.